We’d love your help. Let us know what’s wrong with this preview of The Chaplain's Daughter by Kathleen L. Maher. Ellen White is assigned to attend a debilitated artillery captain after the Battle of S A feisty army laundress must disarm a grieving Confederate captain's pride to win his heart. To ask other readers questions about The Chaplain's Daughter, please sign up. Is this a continuation of book 1? Seemingly abandoned in 1862, The Chaplain’s Daughter, Miss Ellen White has to fend for herself. She finds work as a washerwoman at a field hospital in Virginia until she is pressed upon to help with a badly wounded Captain Gideon Sharpe. After his father, Sam The Chaplain’s Daughter is book two in the series Sons of the Shenandoah by Kathleen L. Maher. Ms. Maher aptly depicts the battle scenes of the war and the resulting nightmares that Gideon experiences. She also shows the strong faith of Ellen, how it permeates het life and how it affects those around her. The author has captured the flavor of the old South and descibes what it was like for a family to be on the Confederate side of the conflict. She lets us see into Ellen’s emotions as she makes her way through difficult times. The hardships that Gideon goes through during battle, losing his wife, being injured and feeling inadequate are eloquently conveyed in this striking novel. I enjoyed reading this story very much! The detail of daily life, finding strength in forgiveness, and the hope of love, despite feeling unworthy. There is tragedy in war, people are injured an many are killed. This story is wonderfully told without gory details. It takes place mostly away from the battlefield. It is a story of one man's injury ( Gideon), a chance encounter with an acquaintance from his past (Ellen) and healing. Not only from his injuries but also of his heart. Ellen is tasked to see that Gideon doesn't die, she is a mere laundress but manages. By divine intervention she is asked by Gideon's father to come home with them and care for Gideon as he recovers. Sam Sharpe is not an easy man but says he will look after her and see that she has a roof over her head. I liked how Ellen had to think about the offer before accepting it. Her reasoning was valid. I liked the bickering between Ellen and Gideon. Each trying to have control over their situation but really, neither does. I loved Gideon's younger brother Ben. He is a bit of a buffer at times but also challenges Gideon in the healing of his soul. I don't give spoilers but I will share a favorite line. "I'll be with you until we are old and full of years..."
You will have to read the book yourself to see when and by whom those words are spoken. War leads to many injuries of the body. It also uncovers other wounds to the souls of men and women, only adding to the sorrow and difficulty that can interfere with healing. In The Chaplain’s Daughter, by author Kathleen L. Maher, these afflictions bring a young laundress, Ellen, into the role of caregiver for Gideon, a seriously wounded army captain. Set in the Civil War, this romance novel reveals the struggle to maintain faith when circumstances challenge one’s belief in a God who cares. Los War leads to many injuries of the body. It also uncovers other wounds to the souls of men and women, only adding to the sorrow and difficulty that can interfere with healing. 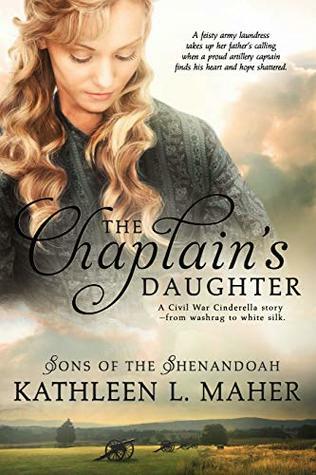 In The Chaplain’s Daughter, by author Kathleen L. Maher, these afflictions bring a young laundress, Ellen, into the role of caregiver for Gideon, a seriously wounded army captain. Set in the Civil War, this romance novel reveals the struggle to maintain faith when circumstances challenge one’s belief in a God who cares. Loss and grief, separation and fear, pain and confusion. These are the elements that threaten to undo faith for both Ellen and Gideon. The Chaplain’s Daughter is a heart-stirring novel of triumph over life’s difficulties. The Chaplain’s Daughter is Book 2 in the Sons of Shenandoah Series. Book 2 in Kathleen L. Maher's Sons of the Shenandoah is a true work of heart. I read and loved Book 1: The Abolitionist's Daughter so I knew I would be reading The Chaplain's Daughter. It did not disappoint. Historical Fiction/Romance is a genre that I don't always find myself eagerly anticipating. I actually avoided it for several years. All that changed within the first few pages of this series. There is such an indescribably potent blend of God, despair, and forgiveness. War is such an ugly th Book 2 in Kathleen L. Maher's Sons of the Shenandoah is a true work of heart. I read and loved Book 1: The Abolitionist's Daughter so I knew I would be reading The Chaplain's Daughter. It did not disappoint. Historical Fiction/Romance is a genre that I don't always find myself eagerly anticipating. I actually avoided it for several years. All that changed within the first few pages of this series. There is such an indescribably potent blend of God, despair, and forgiveness. War is such an ugly thing, a time of death and destruction. This series takes that despair then weaves it into tales of hope and love. I love the phrase 'poetry in motion'. While that fits here, The Chaplain's Daughter feels more like a song. You know that feeling music gives you when you're so wrapped up in the beat everything else disappears? That's what I felt while reading. The words move with precision and grace, floating on wings of prayer and love. Gideon's pain, his feelings of loss and betrayal, keep him from giving in to God's loving embrace. He fights forgiveness tooth and nail as Ellen's soothing presence batters his hardened heart. This is where we find the Christian aspect of the novel, and it is a good one. While it is never burdensome or heavy, God's presence is felt on every page, just as He is a daily presence in our lives. Even when you don't feel Him, He is there. I wish I could give true honor to the writing of The Chaplain's Daughter, but my words are crass and ignorant in the face of the author's beautiful descriptions. I truly believe she could describe a cannonball and make it sound as beautiful as a sunrise. There were countless times when I would have to go back and reread passages because my brain simply melted over the flow of words. For example: "Fort Sumter struck a defiant pose, proud despite her bombardment scars, her staid exterior masking an alluring beauty. The stars and bars sprightly whipping at the flagpole evoked the jaunty plume of a milliner’s hat." I don't know how she does it, but it's amazing. Ellen has gone from being the somewhat spoiled, well-dressed daughter of a minister to a washwoman for the Confederate army. You will admire Ellen as she does what is necessary to provide for herself when she ends up homeless even when that includes assisting the doctor in caring for Captain Gideon Sharpe’s wounds. Gideon is not an easy man to care for! His wife has died during the birth of his twin daughters. Now he is injured and cannot get back to them. God works in the lives of many of the c Ellen has gone from being the somewhat spoiled, well-dressed daughter of a minister to a washwoman for the Confederate army. You will admire Ellen as she does what is necessary to provide for herself when she ends up homeless even when that includes assisting the doctor in caring for Captain Gideon Sharpe’s wounds. Gideon is not an easy man to care for! His wife has died during the birth of his twin daughters. Now he is injured and cannot get back to them. God works in the lives of many of the characters. The Chaplain’s Daughter is an interesting story of life during the Civil War. I received a complimentary advance copy of The Chaplain’s Daughter from the author. This is my honest opinion. The author has done a masterful job of taking us back to the sights and smells of the Revolutionary War. Gideon, a gravely injured captain, is a war hero accused of desertion since he has no recall of his last battle. His anger precludes him from the forgiveness he needs to give in order to accept the love freely given by God and others. Ellen is an army laundress who decides to believe God when He whispers “Trust Me - I've chosen you, child”. A wonderful story of overcoming war, hurts and death The author has done a masterful job of taking us back to the sights and smells of the Revolutionary War. Gideon, a gravely injured captain, is a war hero accused of desertion since he has no recall of his last battle. His anger precludes him from the forgiveness he needs to give in order to accept the love freely given by God and others. Ellen is an army laundress who decides to believe God when He whispers “Trust Me - I've chosen you, child”. A wonderful story of overcoming war, hurts and death to a new life of forgiveness and love. I received this ARC from the author and all impressions and opinions are my own. This was my first book by Kathleen Maher and I really enjoyed it! The details in this story were very accurate. I really liked all of the characters. I really liked the message that came through this book! I know that I will be looking for more books by Kathleen Maher! As war tumbles around them and their world falls apart two hearts reach out to find a place of security and family. Well written saga.